The FastPBX 5-Line IP Phone also supports multimedia functions including playing MP3s and digital photo display. The 5-Line IP phone supports up to two SPA500DS attendant consoles for one-touch transfer and effective call flow management. The FastPBX 5-Line IP Phone also supports multimedia functions including playing MP3s and digital photo display. The 5-Line IP phone supports up to two SPA500DS attendant consoles for one-touch transfer and effective call flow management. If you’re in need of a business phone that offers all the bells and whistles to streamline your communications, the FastPBX 5-Line IP Phone is your best bet. Save money and time with a FastPBX 5-Line IP Phone and take advantage of its powerful capabilities. 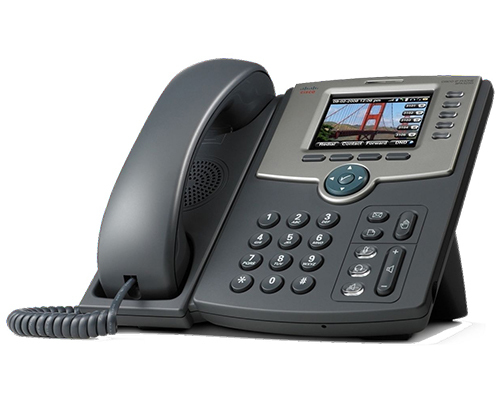 Standard features on the Cisco SPA525G include five active lines, VLAN-capable dual switched Ethernet ports, 802.3af PoE support, a 3.2-inch QVGA color display, a full-duplex, high-quality speakerphone, a Bluetooth interface for headset connectivity, a Wireless-G (802.11g) client, a 2.5-mm stereo headset port, and a USB 2.0 host port. The Cisco SPA525G provides encrypted signaling, media, and provisioning information, using state-of-the-art technologies such as Session Initiation Protocol (SIP) over Transport Layer Security (TLS), Secure RTP, and HTTPS/SSL to secure communications between the user and service provider. Cisco SPA Secure Remote Provisioning provides a highly secure mechanism for the service provider to remotely manage the phone/user configuration and the device software upgrades.